Tradiebot Industries an Australian based Auto Innovation company has officially launched its Augmented Reality software application WorxAR on the weekend at the AAAA / Collision Repair Expo in Melbourne. The cutting-edge innovation will allow latest release information to be delivered to users at the touch of their fingertips via smart devices such as phones and tablets like never before. Augmented Reality (AR) is the technology currently making a big impact with industrial applications allowing technicians to perform service and repairs by accessing the latest digital repair processes and service manuals. The technology is also being used for training, providing a new level of digital knowledge that has not been seen before. The response by people attending the expo and witnessing the technology first hand was one of excitement and amazement that such a digital tool was now available. Dimovski stated that having such technology on offer will be a game changer. Context relevant information can now be delivered in an on-the-job interactive way that is so intuitive and effortless for end users to assist in repairs, service, maintenance and training. Tradiebot has started fielding expressions of interest from a broad range of potential automotive based customers from across the world that could utilise this software technology for their own products and services. The profile of users is extremally broad from OEM, training providers to machinery and equipment manufacturers from around the world wanting to turn their current paper-based manuals and processes into a digital interactive platform like WorxAR. Augmented Reality (AR) is the technology currently making a big impact with industrial applications allowing technicians to perform service and repairs by accessing the latest digital repair processes and service manuals. The technology is also being use for training providing a new level of digital knowledge like never before. AR App’s enable the user to view the real world with overlayed computer-generated images (CGI) – part design information, CAD data, text and animations projected in the user’s field of view. As this technology is still evolving, there are several different levels of augmentation ranging from simple heads up displays to systems that blur the lines between what is real and CGI. For OEM repair and service procedures, training manuals or data from equipment can be presented on a virtual dashboard. Similarly, virtual quality control check sheets can prompt the user to verify the status and condition of the job including capturing data and images for quality records. Another useful application is with remote technical advice. The user can enter a remote video link with a technical expert and get interactive guidance for troubleshooting and calling up technical details on the job at hand as well as relay the system status of the object. No more lost time searching for information or asking other technicians as this new technology, accessible via your smartphone, tablet or an AR headset, directs your attention to its exact location and provides information live at your fingertips. The system also provides multiuser interactivity with stakeholders in the value chain. For example, a manufacturer can verify the correct repair procedures used by the repair facility and the repair service centre may in turn provide the vehicle owner access to a quality assurance report confirming the vehicle repairs are to OEM standard. The most common AR tools are everyday smartphones and tablets. More recently a range of AR headsets have become available, looking almost like normal reading glasses or sunglasses. The higher end AR technologies can detect real world objects and allow CGI and data interaction with these objects on the multiuser platform. These systems also enable interactive real-time video streaming, remote communications and information exchange via a multiuser platform. NCR: Tell us a bit about who you are and where you’ve come from. MD: I started my career at 16 years of age as a plastic bumper repairer and by 22 opened my first business in bumper repairs. Over the last two decades I have owned several ventures in automotive plastic repair, parts recycling and mobile technology, including working for a couple of leading companies related to the collision industry. Not unlike other passionate entrepreneurs, some of the ventures have not quite worked out, whilst others have been very successful. In 2014 I decided that I needed to fully understand the collision repair process and fine tune my own skillset, so I sought to locate myself inside a panel shop with a view to challenging the status quo on plastic repair in the industry. An old friend, John Spiteri from Rigoli Smash, supported the experiment and for the next 12 months I did all their plastic repairs in-house. It was a huge success, with significant efficiency gains and cost savings. The whole exercise was effectively a pilot program for what became Plastfix. Plastfix was born, and over the last four years we have been the industry’s leading plastic repair solutions provider, with 36 staff across Australia and NZ exclusively servicing Capital SMART’s 45 repair facilities. We run a unique model in that we provide trained technicians to work on site and we manage all aspects of the business centrally. We developed our own hand tools, repair processes and training programs and have 170 online training videos. Every repair is file-finished (no filler) and all technicians are in-house certified and utilise our digital platform on their company smart device. I am passionate about new technologies and digital transformations and an avid researcher of what’s new and what’s coming. I enjoy networking, meeting like-minded people and attending expos and conferences to see what’s out there and how we can improve. I travel extensively, attending events and building my network to better understand new technologies and possible solutions for my business and the collision repair industry. All this knowledge has been channelled into Tradiebot, which I founded in 2017, where we develop technologies and artificial intelligence systems for the collision repair industry with the aim to shift manual processes to be more digital and automated. NCR: What was the inspiration behind Tradiebot? MD: It all started back in 2014 as my fascination for 3D printing grew. It’s possible to use it in the plastic repair process, especially on headlight lugs. I found a myriad of information, but it was a challenge to separate the “fact from fiction”. For about 24 months we played around with 3D printed lugs for bumpers and headlights and, working with the world’s leaders in 3D printing technology, looked at how we could repair them. There is a huge number of headlight assemblies going to landfill – because they are not recyclable and too hard to separate. There had to be a way to avoid this. In early 2017, in one of those “light bulb” moments – marrying our work on 3D scanning technology with our 3D printing of the lugs – we may have found a solution, although we needed a partner to develop and protect this valuable IP. By chance I was attending the 2017 Avalon Air Show and I met the Swinburne University team who were demonstrating their work in materials and robotics and I knew then that this was it. I began to research their capabilities and plan the next step. I presented our proposal and, through the course of the discussion, it became clear we were destined to work together. They also introduced the project to IMCRC who agreed to co-fund the project on behalf of the federal government to the tune of $1.2 million – Project Repair-bot was born. We are now well past proof-ofconcept in our foundation project, which is the development of a robot that repairs automotive parts and the invention of our own plastic 3D printing material that is compatible with automotive plastic parts. Tradiebot has several other innovation projects with potential patents, and is working with several stakeholders to develop these innovations. Total investment is almost to $6 million, including government co-contributions. NCR: What can you tell us about your “foundation partners”? MD: As we started generating exposure about what we were doing, people began to see us as the innovators, not just in collision repair but across the board in the Industry 4.0 space. We were this little Aussie company with big ideas and several industry leaders expressed interest in working with us. We were open to working with those that suited the needs of the projects. We decided who was right for Tradiebot and focussed on setting up collaborations with PPG Industries, Capital SMART and AMA Group on separate projects. Each partner was specifically selected for a reason: we have relationships, they are local, we collaborate with each other and they are our pathway to validation. When you are working with the two biggest consolidators, you really know you’re onto something, although as we are partially governmentfunded, we have an obligation to provide a level playing field when we receive expressions of interest – but it must be the right partner. We are very excited about what the partners bring to the table and look forward to growing our relationship and creating some exciting things in the not-toodistant future. NCR: Just before we turn to Jason, what have been the “big ticket” achievements in your first 12 months? MD: Notwithstanding the technology achievements, material inventions and planned patents in progress, undoubtedly the biggest achievement is bringing together the Tradiebot team. We have some of the brightest global minds from academia and industry in the fields of robotics, material development, 3D printing, artificial intelligence, augmented reality, and more. I never cease to be amazed by the calibre of the individuals and their qualifications and they are who has made it all happen thus far. The Tradiebot team has now grown to be 20 strong, undoubtedly the most dynamic team on track to digitally transform sectors of the collision repair industry as we know it. NCR: Now, turning to the lynchpin of the team, Jason – tell us a bit about your background and how you came to be at Tradiebot. JM: I completed a Metallurgy and Materials Engineering degree at RMIT. My first role, in 1992, was with Holden’s Engine Company developing materials, processes and quality systems. I then moved to Bendix Mintex to work on friction material for brake pads as well as process development and field application. From there, I went to Delphi Automotive, working on fuel systems for the locally-based OEMs. In 1999, to enhance my business credentials, I completed a Master of Management (Technology) at Melbourne Business School, following which I moved to a CSRIO spin-off company outside the automotive industry for a short time before returning to the industry. I joined Clutch Industries and then went on to Futuris Automotive, which really was a milestone in my career. I became Manager of Advanced Development where I worked closely with the Automotive CRC and developed a strong network across the major universities, including Swinburne, which I joined in 2013 as Research Project Manager. It was at Swinburne where, among many other projects, I became involved with the Repair Bot project and was part of the team that got the IMCRC across the line as a key partner. As my contract at Swinburne was coming to an end, I was offered the COO role at Tradiebot. NCR: COO can mean different things in different organisations – what does the role at Tradiebot encompass? JM: I see my role as very much engineering-focused, focused on product development methodologies, matching our projects to customers’ needs and prioritising and assessing the commercial viability of each project. It’s largely a program management function with clear disciplines that bring all the pieces together. Really, it’s a technical and operations role encompassing all aspects of the business. NCR: What can we expect to see from Tradiebot over the next 12 months? JM: I see my major focus over the next 12 months as developing relationships with prospective clients, getting time on the shop floor and understanding their needs. This will allow me to customise the roll-out of each project as, obviously, each client has quite different needs. In fact, sometimes the same client has different needs across their different sites. The application of our technology is wide and varied and there is even potential for us to apply for patents on novel technology applications. NCR: Mario, your augmented reality was on show at the Campbelltown TAFE open day. How is this going? MD: We will have all of this on display at the Collision Repair Expo and I’m sure people attending will find it a lot of fun and informative. The AR applications are endless: from using this digital information in repair procedures to scanning the vehicle to assess the damage – it opens a whole new world to the technician of the future. In addition, the potential efficiency improvements are astronomical. To make this happen, we need CAD and for access to CAD we need the OEMs. However, as a back-up we have already started to develop our own CAD from surface models of parts and vehicles. JM: Just to clarify – there is a distinction between the detailed design, which is loosely defined as the CAD, and then there are the digitised surfaces that provide the data required for these services. NCR: So, what does this mean to the collision repairer? MD: It may well mean that Tradiebot will become a digital supplier of parts between the OEM and the repairer, which is particularly important for 3D printing of replacement parts and even doing repairs robotically or cross-referencing damage on claims. In a similar vein, we may well be the supplier of the CAD data that allows the digital dismantling of the vehicle – there are prospective partners out there today. NCR: What will success look like from your partners’ perspective? JM: The answer simply gets down to economics. If our partners can add value to their businesses – sell more products, increase efficiencies, improve profitability – then they will see their involvement as a real success. In addition, there’s the kudos of being involved with a cutting-edge innovator and innovation is what creates the competitive edge. NCR: You are clearly challenging the status quo – what will we look like in three to five years? MD: The current repair processes will be nothing like what they are today – guaranteed! There will be automation, digital technologies, integrated supply chains all running on a single platform. It’s happening now in other industries – we’re bringing it to the collision repair sector. JM: If you look at the technology in the OEM sector – that’s what it will be like in the repair shops and it’s our partners – the visionaries in the industry – that will make this happen. However, let’s not forget these business leaders also have the more immediate pressures of running their businesses, but it’s their commitment to finding a better way that sets them apart. MD: It’s Jason’s role to put all the parts together and help the body shops become more efficient, effective and generate a better-quality output. A good example is the use of AR in a post-scan scenario when the results are there for all to see and the records are retained – even the customers can see the results of the repair, giving them greater peace of mind. NCR: And a closing comment? JM: Let’s get people doing what people are good at, get machines doing what machines are good at and let’s bring it all together. It’s a myth that robots will take all the jobs – the reality is that the technology will create different and more exciting jobs for the technician of the future. MD: For me, the most important message is acceptance. We are “Open for Business”, I invite key industry stakeholders willing to explore best methods and pathways to deliver such technologies to the collision repair industry, to work together to take a much-needed quantum leap. Tradiebot founder Mario Dimovski one of the key speakers at this year years Industrial Internet 4.0 summit who will be covering developments in 3d printing and robotic systems in the automotive repair space. Understanding Ai and creating new digital skills. 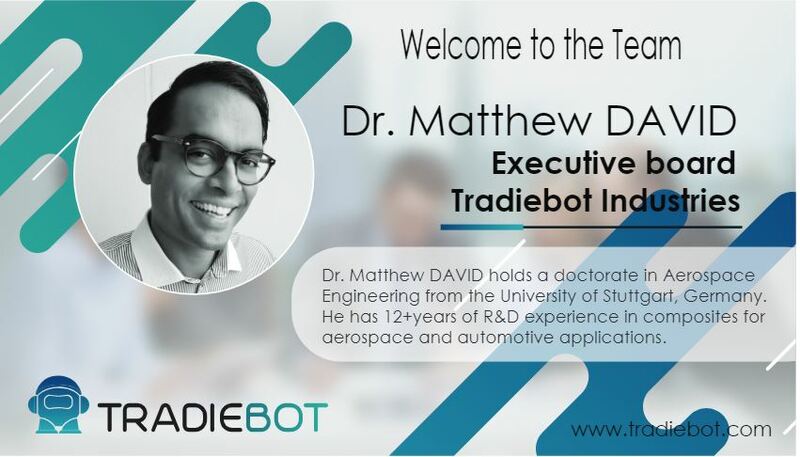 As we expand our team of industry 4.0 professionals and experts, Tradiebot welcomes Dr. Mathew David to our executive board. Dr. Matthew David holds a doctorate in Aerospace Engineering from the University of Stuttgart, Germany. He has 12+years of R&D experience in composites for aerospace and automotive applications. He began his career at the German Aerospace Center (DLR) as a research engineer focused on activities in the field of crashworthiness and composite bonding technologies. During his time at DLR, he collaborated on various multi-disciplinary research programs with international research institutions and government agencies. Following this, he joined Multimatic, a tier 1 Canadian automotive parts supplier where he was a key contributor to the development of high performance composite parts using advanced modelling and simulation tools. Currently Dr. David is Centre Manager of AMAC at UNSW where he contributes his technical expertise to a variety of advanced manufacturing projects. These include automated composite manufacturing and enabling technologies for Industry 4.0, a key initiative helping Australian companies to engage in applications through the introduction of smart monitoring of manufacturing processes and structural health monitoring. Dr David is the latest of the Tradiebot recruits to join the management and development team. We look forward to Dr David’s contribution as we deliver a new generation of technologies for the collision repair industry.